What a great day we had today in Helsinki. We showed three females on Helsinki Winner 2015. Judge Nina Karlsdotter, Sweden. Our little girl Dara (Dreamkiss One of A Kind) made her debut on this show, and what a result! Junior Helsinki Winner 2015, Helsinki WInner 2015, CAC and BOS!!! 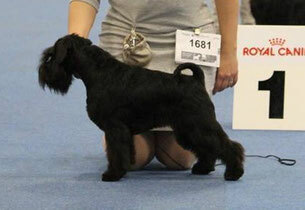 Sandra (Raven's Tot Keen Sensation) was 2nd Best Female and got CACIB. Britney (Raven's Tot Just Dance) was 3rd in Champion class with SA. Thank you for picture, Mira Sandström!